Our Sale Price: Call before placing order. Call 205.533.8595 before placing order. 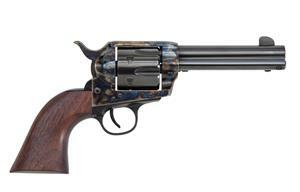 This model is .357 MAG, has a walnut grip, and has a 4.75" Color-Case hardened finish barrel. This is a 6-shot revolver. The Single Action firearms will not be available for purchase on our website. To order, please call 205-533-8595. Firearms must be purchased on a separate purchase order with no other products included. This is so all parties involved can track the transfer and shipping of the firearm. Please check your local laws for restrictions before ordering firearms. It is the responsibility of the buyer to make sure that your purchase meets all local, county, and state law requirements. Find a licensed FFL holder in your area. Click here https://www.ffldealerlocator.com/ for listed FFL dealers in your area if you don’t already have a preference. To receive your order as quickly as possible, locate a FFL dealer to transfer your gun before you place your order; this will help assure us that all legal requirements are met. However, you can place your order first and then provide us with your FFL holder/dealer information before we ship. We will hold your order until you locate a dealer and arrange a transfer. Contact the FFL dealer and let them know you would like to receive a firearm for transfer from Old South Firearms, LLC. Be sure to ask about their FFL transfer fee, commonly around $25.00 to $35.00. You may consider contacting more than one dealer to compare prices. Your dealer can send a copy of their FFL to this e-mail address: Sales@oldsouthfirearms.com or they can contact us at 205.533.8595 for additional information. Once you have selected an FFL holder for your transfer, please contact us with the dealer’s business name, address, and phone number so we know where to ship your firearm. You may do this by replying to your “Order Conformation” that you received from us. Please include this ORDER NUMBER on any correspondence you or your FFL holder may send us. Important: Upon arrival to pick up your firearm, make certain that everything is acceptable before filling out the necessary paperwork. Once the transfer of the firearm is complete, the manufacturer's warranty is then in effect; from that point on any complications with the firearm will need to be handled by the manufacturer. Handguns must be on Approved List http://certguns.doj.ca.gov/ . Assault weapons must be CA Approved.